When presenting these to your friends and family, you’ll be met with the same childlike enthusiasm, responses and excitement that is usually reserved for birthday cakes and the opening of Christmas gifts. Dishes like this bring out the children in all of us. This twist on the baked potato is like eating a stack of potato chips with a velvety baked potato center. Be forewarned, you’ll need a razor-sharp knife for the task of slicing the potatoes, otherwise you’ll be cursing my name. I used a sushi mat, folded equally on both sides, to keep my knife from slicing completely through the potato. If you don’t have a sushi mat, chopsticks or a pair of wooden utensils would work, as well. Although, a sushi mat is perfect for the job because you can roll it onto itself to control the thickness of the base of your potatoes. 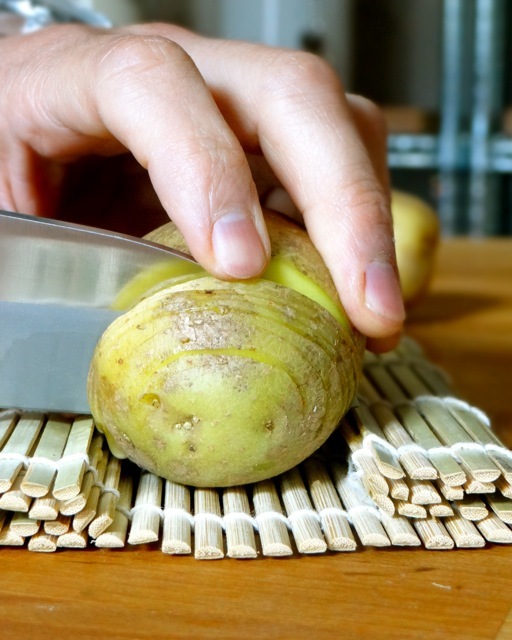 Use a pair of chopsticks or a sushi-mat folded on both side to prevent your knife from slicing through the potatoes. Be sure to thoroughly dry off the potatoes with a clean kitchen towel. Using a sharp knife, carefully cut thin slices into the potatoes without completely slicing through the bottom half. The thinner your slices, the more crispy, potato-chip-like edges you’ll have. You can use a sushi mat, chopsticks or or a pair of wooden spoons to prevent slicing all the way through the other side of the potato. Place the potatoes, sliced side up, on a baking sheet. Brush the potatoes with olive oil, and sprinkle them liberally with sea salt and pepper. Bake the potatoes in the center of the oven. After 15 minutes, open the oven to allow the steam to escape. 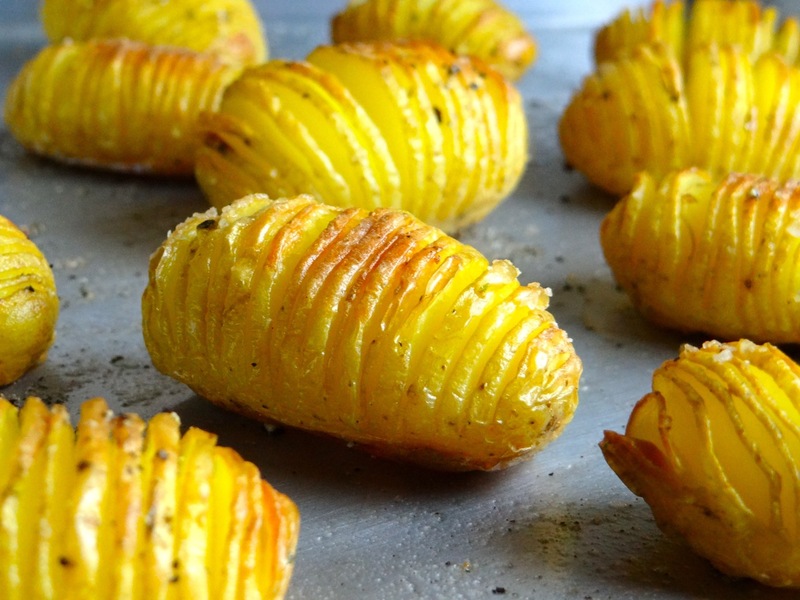 Brush the potatoes once more with olive oil, and continue baking for 30-60 minutes, or until done. I know there’s huge variance between 30-60 minutes; so much of this depends of the type of potato you’re baking and how big they are, but you’ll know that the potatoes are done when you can easily pierce through the slices of the potato with a skewer. The potatoes should slightly fan open, and the edge of the slices should take on a beautiful golden brown. Remove from the oven and top with your favorite toppings. Serve hot.